After stunning the motoring world with a compact executive saloon that easily matched the usual German suspects for driving enjoyment, Honda has managed to repeat its success with the wagon variant of its acclaimed Accord. A clever rear seat folding mechanism, powered tailgate and sports saloon handling belie this car's load-lugging role. Honda has always been serious about making good cars. Its products have always been popular with owners who appreciated reliability, durability and refinement above all other attributes. But for the vast majority, an engaging driving experience and some semblance of style are often more compelling reasons to purchase a particular car, hence why continental rivals have always had the upper hand. Unlike previous Accord line-ups, this one has been unashamedly designed from the outset to compete head-on with the best Europe has to offer – from the humble Ford Mondeo to the ultra-desirable BMW 3 Series. That Honda has succeeded in tempting countless buyers, some of them your average badge snobs, away from the traditional compact execs that dominate company car parks is a sign that the firm has finally arrived. With its Tourer variant, the company is repeating this success in the burgeoning sports estate sector. There's something the Accord can offer that many of its rivals can't: space. The Avants, Sportswagons and Tourings of this world can't hold a candle to the Accord's voluminous boot and impressive rear seat folding mechanism. Furthermore, this surfeit of space isn't at the expense of handling or ride – the Tourer is a sports exec, after all. To ram home the car's ability to satisfy the demands of both practical and sporty-minded buyers, the firm's Type S variant boasts all the correct sporty adornments and looks every inch the near-200bhp machine that it is. On the other hand, buyers seeking versatility and frugality can always pick the company's critically acclaimed diesel model. Now, who said Honda wasn't serious about succeeding in Europe? After years of being portrayed as a maker of worthy but dull family motors that never broke down, Honda has turned a corner and is now making cars that you can buy with your head and your heart. The Accord Tourer faithfully follows the saloon template, and with its voluminous load bay and smart folding rear seats proves that the car is not all show. The premium aura that radiates from the Accord Tourer is, surprisingly, not reflected in the car's price tag. Despite offering an experience on a par with BMWs and Audis, prices are closer to high-end Mondeos and Vectras. Also in the Honda's favour is its generous level of standard equipment, solid residuals and its maker's strong reliability reputation. Unless you're hooked on the 2.4 Type S's high-revving power delivery, the diesel option will be the safer bet in terms of cost savings. Decent fuel economy, low emissions and tax costs make this engine one of the best around. The car's svelte profile hides a cavernous loadspace boasting a clever rear seat folding mechanism and a convenient under-floor stowage compartment. The latter is at the expense of a spare wheel, while the 60/40 split rear bench folds flat at the pull of a lever – a truly ingenious mechanism. With the seats up or down, the Accord Tourer will swallow more than its mass market peers, providing 575 litres and 1,707 litres of space respectively. Passenger space is generous, there are numerous places to store oddments and the powered tailgate is a useful addition to the Honda's armoury. Every switch and dial operates with a reassuring slickness, and all the major controls are placed within easy reach of the driver and front seat passenger. The ventilation control panel is refreshingly logical in its layout, while the instruments are clear and easy to read – even at night. The sat-nav option is simple to operate and boasts a bright display screen. Of paramount importance in a sporty car is the quality of the gearshift, which in the Accord's case is a peach. The short, accurate manual shift is a joy to use. The auto stick is not bad, either. Anyone seeking a Lexus-like ride from the Accord will be disappointed. As befits a car seeking to give its driver a good time, there will always be a trade off between ride comfort and handling. 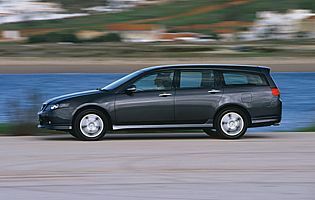 That the Accord Tourer manages to deliver a balanced performance is commendable. Although slightly firm around town, and most noticeable in the Type S, the ride is never uncomfortable. The supportive front seats come into their own on twisty roads, and getting comfortable behind the wheel is easy thanks to a multitude of adjustments. The steering wheel also adjusts for both reach and rake. There are no surprises in the security department for the Accord, just the usual deadlocks, remote central locking and alarm/immobiliser across the entire range. While more than adequate, the chance to add a third-party tracking device could be money well spent. At least there's little chance of the car's audio equipment being stolen as it's unique to the Accord's fascia and won't fit other cars. At this level there's often little to separate competing brands, as so many cars come with an abundance of airbags and driver traction aids. The Accord is no different; packing all the right bits to help you avoid a crash and, if all else fails, protect you in the event of an impact. Twin front, side and curtain airbags are present, as is ABS and numerous other traction and stability aids. In Type S trim the front-wheel drive Accord is especially potent, but never feels anything but stable even when being pushed hard. 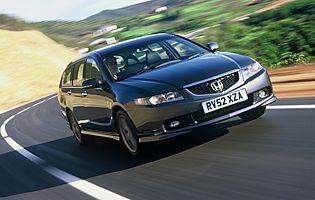 The Accord has always been an enjoyable drive and this latest example continues Honda's reputation – it's now good enough to challenge the established players such as BMW and Audi. While the car's low driving position helps, it's the car's chassis and engines that are the main players. For a large, front-wheel drive car the Tourer is surprisingly nimble. In sporty Type S trim the 2.4 petrol motor is a willing and potent companion, the steering pleasingly direct and the six-speed gearbox slick. In contrast, the 2.0 petrol is tuneful but lacks outright pace. The diesel is a pleasant surprise and superb all rounder. Anyone seeking an alternative to bulky, unwieldy, high-rise MPVs that lack driver appeal would do well to sample this Honda. Although it will 'only' seat five – four will be more comfortable – luggage space is exemplary and not at the expense of passenger accommodation. And there's no need to remove heavy seats to facilitate the transformation to monster load-lugger as the rear chairs simply fold flat at the pull of a lever. Even with the seats up there's an abundance of room. From a safety angle everything's covered with the car's plethora of airbags and driving aids. The Accord Tourer is not your average first car. It's big, expensive – for anyone who's just torn up their L-plates, anyway – and probably a little too powerful for someone used to small capacity superminis. Parking could be a challenge for anyone not used to a car this size, and there's also the thorny subject of running costs – not least the dreaded insurance premium. Honda has never made a duff car – only ones lacking character. Offsetting this is the company's reputation for building cars that outlast the competition. While the latter remains true even today, the need to compete on level terms with Euro rivals has seen Honda deliver models with more personality. While always a favourite of mature private buyers, the new Accord is unashamedly pitched at younger buyers who would otherwise opt for the likes of a 3 Series. That is high praise indeed considering that the car is priced closer to well equipped Ford Mondeos and Nissan Primeras. The trend for mounting seats high in a bid to make access and egress easier has passed Honda by on this occasion. This is actually a good thing, as there's nothing more frustrating than driving enthusiastically when perched up high like in a compact MPV. Take the trouble to sit down in one of the supportive seats and you'll feel immediately at home. Rear seat occupants fare well in the Accord Tourer; the doors open wide and legroom is ample. The car's powered tailgate is no gimmick as it makes loading easy when laden with shopping. The standard fit audio system is not to be sniffed at. A three-band radio and single CD player is fitted to SE and Type S variants, with the luxury Executive receiving a six-disc, in-dash CD changer and more powerful amplifier. All cars come with convenient steering wheel-mounted audio controls. Sound quality is comfortably a cut above the efforts of most manufacturers in this class. The easy to use sat-nav is standard on the 2.4 Executive and optional on the other luxury-spec variants. 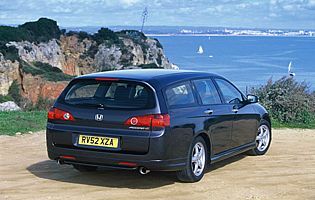 Honda offers the car in a choice of eight different colours, and they all flatter the car. The butch-looking Type S variant looks best in a dark hue, as this shows off the car's modest bodykit and chunky alloy wheels. Inside, the Tourer follows the same line as its saloon relation. The cabin plastics easily match those of the European competition. Seats are cloth trimmed across the range – leather on the Executive. Buyers get the option of a dark or light-coloured cabin depending on body colour. 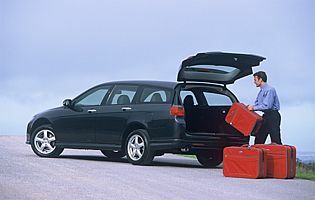 There's no mistaking the fact that Honda's premium load-lugger is a large car. A quick walk around it will confirm this, yet from behind the wheel it feels no more unwieldy than a conventional saloon. All round visibility is good and all three rear-facing mirrors offer a decent view. Blind spots have been kept to a welcome minimum, and the car's steering requires little effort during slow speed manoeuvres. Sadly, despite their obvious usefulness, parking sensors are not offered. Accord Tourer ditches spacesaver from saloon in favour of a 'spare tyre repair kit' comprising inflation mousse and a built-in compressor. A conventional spacesaver is a cost option. Three engine options – 2.0-litre (153bhp) petrol; 2.4-litre (187bhp) petrol; 2.2-litre diesel (138). 2.0 petrol and 2.2 diesel fitted with five-speed manual box, with 2.4 petrol fitted with six-speed manual transmission. Five speed auto available on selected models – not diesel or 2.4 Type S. Three main trim levels: SE, Sport and Executive. Type S is reserved for flagship 2.4 petrol variant.